The American Craftsman style was born of the Arts and Crafts movement which began in England. It shared the foundational ideal of producing hand-crafted pieces created by skilled artisans. In accord with our English counterparts, the movement here was also an attempt to resist the industrialization of all crafts. The American movement was a bit more varied, demonstrating regional influences (Mission in California and the desert Southwest, Prairie in the upper Midwest, etc.). In addition, the American style drew design ideas from home-grown traditions like those of the Shakers. The Shakers lived in fully self-sufficient communities. This meant, among other things, that they created their own furniture. These pieces were extremely well-built, designed to last (forever) so as not to waste resources. In keeping with the idea of avoiding waste, and in an attempt to avoid the sin of pride, adornment was kept to a minimum. This minimalism even extended to the very limited number of colors allowed in painted furniture (essentially primary colors). By and large, if a piece was painted instead of stained, it would be painted a uniform color. Aspects of the Shaker style that were drawn into the American Craftsman aesthetic include its clean lines, sturdiness, durability, and quality craftsmanship. We lean heavily on these design elements in our creations at Lambkin Studios. 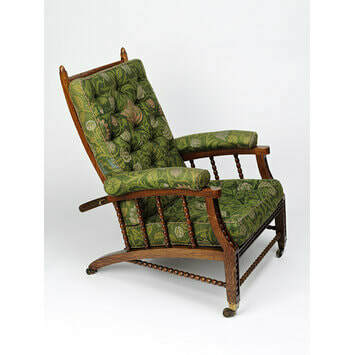 We also look to the influences of Gustav Stickley and the Japonism movement. 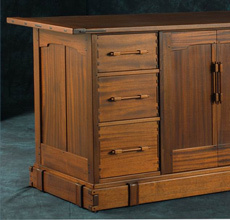 Stickley’s style is known for clean straight lines as well as for showcasing joinery, a means of demonstrating the craftsmanship of the piece. Stickley also gets the credit for the moniker Craftsman style. His magazine (catalog) was titled The Craftsman. Frank Lloyd Wright, a Stickley contemporary, and the most well-known designer of the Arts and Crafts movement in America, has been listed as the most influential architect of all time. His influence can also be seen in our creations. Have you noticed how our tree-line dressers are reminiscent of his flat-roofed houses? Despite the fact that the Craftsman movement began more than a century ago, the style remains incredibly popular even today. It’s a design language that seems to remind us of an era when quality and craftsmanship were hallmarks, badges of honor. We are grateful to be part of the rebirth of that movement and mindset. Over the years, veneer has gotten a bit of a bad reputation. You can find examples of old furniture with cracked and/or peeling veneer, which has led many to believe that it is not a good choice for furniture, especially heirloom quality pieces. We would like to put your fears to rest. But first, an explanation as to why grandma’s veneer peeled and yours will not. For thousands of years, until the early 1980s, the dominant glue used in furniture-making was a product called hide glue. Makers would apply glue to the wood surface, press the veneer to the glue, and voilà a beautifully veneered piece was created. What happens over a few decades is that the hide glue dries out and becomes brittle. When brittle, bumping an old veneered table top or face of a door causes the dried out glue to (in essence) shatter, which weakens the glue’s adhesive properties, making the veneer prone to peeling and chipping. Water, including humidity, can also mix with the dried glue, making the glue pliable once more. That may seem like a good thing, but this pliability also weakens the glue’s adhesive properties, again, allowing the veneer to bubble, crack, and peel. Advances in glue technology (yes, there’s tech in glue!) have radically changed the use of veneer. When designed properly, a veneered piece is just as well-crafted and durable as a solid wood piece, if not more so. Why? Glad you asked. ​First, any time you want to create a pattern, for example, see the grain running in different directions within a wine cabinet door, you must use veneer. If you created a door by gluing together pieces of solid wood with the grain running in different directions, the joints (places where two different grains of wood meet) would break over time as the solid wood expands and contracts. Remember the bit above about hide glue? Modern wood glue never completely hardens. This means that it allows the wood to expand and contract. That’s a good thing when bonding pieces of wood in which the grain is running the same direction. However, when the grain runs in opposite directions, the wood expands and contracts in different directions, eventually overstressing the adhesive properties of the glue, causing the glue to fail. Second, veneer atop high quality hardwood plywood can make for a much more durable product, especially if that product involves doors. Have you ever had a piece of furniture with doors that worked beautifully when you first bought it; but, over time, the doors started to rub against one another or against the top or bottom of the cabinet itself? That can happen with solid hardwood doors, again because of general expansion and contraction over time. Warm (generally humid) air causes the wood to expand. Cold (generally drier) air causes the wood to contract. Plywood does not do expand and contract. It is composed of several layers of wood, stacked in alternating directions. Think of it like scar tissue. Layer upon layer laid down in various directions creates a strong, tight bond, that restricts movement. While not great in muscle tissue, this restriction is advantageous in wood. Note: What most people picture when they hear the term plywood is a product called chipboard (think of the most inexpensive furniture you have ever seen or owned). Hardwood plywood is actually multiple layers of solid wood arranged in a way that makes the final product even more stable and durable than a piece of hardwood. Third, modern veneer glue is so much stronger than hide glue. Remember those advances in technology we mentioned above? They have made all the difference in the world when it comes to the longevity of new veneer. The modern glue forms a different type of bond between the plywood and the veneer. This chemical bond is much more stable and enduring than the hide glue adhesion. 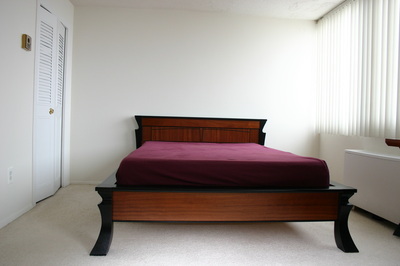 Last but certainly not least, we encourage the use of veneer because is inherently a better use of the material (wood). In other words, veneer is a more sustainable option than solid wood. Instead of using a ¾ inch thick piece of mahogany to create a cabinet door or a coffee table top, you can apply a 1/32 inch piece of mahogany veneer atop a hardwood plywood substrate that is either GREENGUARD or FSC compliant. High quality plywood (what we use) is composed of fast-growing hardwoods, like poplar, that are managed for sustainability. Our company conservation ethic holds sustainability as a core principle. While we love working with sustainably harvested woods of all kinds, we also see veneered plywood as a sustainable option for custom furniture. As we approach our best-loved holiday, Thanksgiving, it seems appropriate to write a little something about giving, as in giving back. As kids we were involved in scouts and in our faith communities. As adults, we’ve served with a variety of organizations from the Red Cross to Touch of Relief and more faith communities. 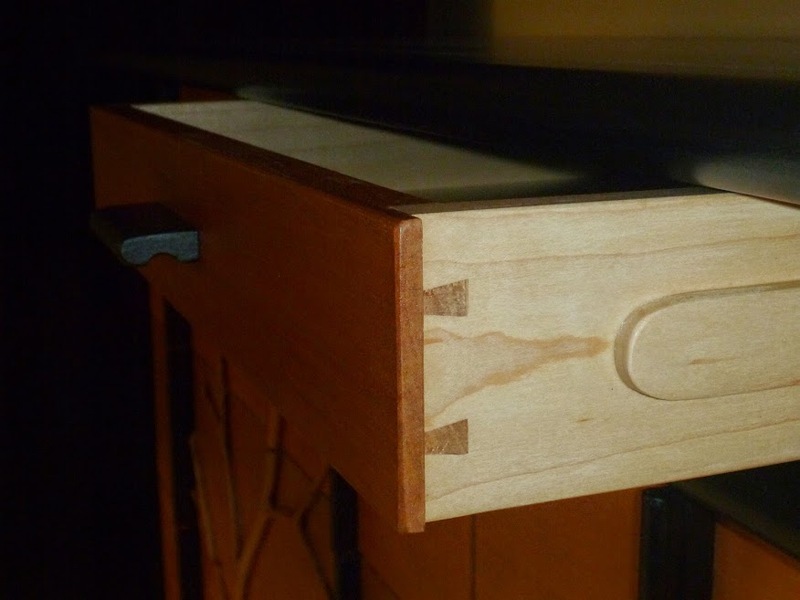 Over the years, we’ve also been fortunate to create links between woodworking and giving back. In the early 2000s, Sean received an opportunity to volunteer with an organization in India. The Apne Aap Women’s Collective helps trafficked girls, women and their children transition out of the red-light district. One pathway out of that life is education. Sean was invited to the organization’s Calcutta school to teach woodworking skills to children. With a bare-bones budget, he formed a classroom, designed a teaching program, sourced materials and tools, and taught foundational math and design skills to more than 20 boys and girls. They learned how to use hand tools to saw, plane, shape, carve, and more over the course of six months. After completing their studies, four of the boys successfully formed their own furniture-making business! The Apne Aap program was so well-received that Sean was invited back to India for another three months. The second trip was to the Himalayas to aid the Society for Integrated Development of the Himalayas in establishing a trade school in Kempty. Sean assisted in physically building the school as well as setting up another foundational course in woodworking. Here in the Shenandoah Valley, we are enjoying new volunteer opportunities with the Staunton Makerspace. Being next-door neighbors (literally) makes it an obvious partnership. We’ve been helping the Makerspace team set up shop in their new-to-them space—building walls, setting up woodworking equipment, prepping the pottery space, and more. We’re really looking forward to teaching classes once they’re fully up and running. We’re also extremely excited about the chance to offer apprenticeships now that we have a big enough space of our own. We are exploring the possibility of a partnership with Valley Career and Technical Center. More to follow as that vision unfolds! Giving back is such a wonderful way to connect with people in our communities. It’s also a blessing to be able to pay it forward. Our families are big on service—teachers, public servants, providers of medical care, and volunteers. If you’ve never had the chance to volunteer in the long-term, we highly recommend it. Studies show that volunteering is good for your health! Even if you only volunteer a handful of times each year, have some fun with it. Your future self will thank you for it! There’s a reason we refer to our products as handmade. We love hand tools. To us, they are a key part of what it means to hand craft a piece of furniture. The proliferation of CNC (computer numerical control) machines means that much of what we do to make our furniture could be taken over by machine. But, as perfect as every one of those forms and angles may be (courtesy of artificial intelligence) we prefer the human touch. We’re not against technology—we love our Festools, too. Carving every piece without the aid of power tools (saws, joiners, sanders) would take ages. 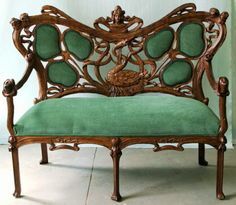 But when it comes to the artistry of a piece—those subtle touches that make it closer to sculpture than furniture—the human eye and hand create something so much more enriching to your home than a piece derived from even the most carefully crafted, creative design sifted through code and into the wood. There’s a subtlety of character that comes with the use of hand tools. Using a planer and chisels, hand cutting veneer and hand sanding the fiddly bits, brings something uniquely personal to each and every piece we make. The invisible marks of the artisan remain in every fitted joint, every sculpted angle, every hand-carved pattern. This is what it means to celebrate craftsmanship in furniture. This is how we deliver heirloom-worthy products to our clients. This is why we love what we do. ​Sustainability is a core business tenet at Lambkin Studios. One dictionary definition of sustainability is: the rate of renewable resource harvest, pollution creation, and non-renewable resource depletion that can be continued indefinitely. We are very aware that building furniture consumes natural resources. Working in a manner that ensures minimal consumption as well as minimal pollution creation is part of the environmental stewardship ethic we practice. We believe it’s the right way to do business. Wood materials that we use in our furniture are certified by the Forest Stewardship Council (FSC) or other like-minded organizations to ensure they’ve been sustainably harvested. FSC’s certification program follows the chain of custody from the land to the lumber yard. To establish this chain of custody, FSC has partnered with organizations around the globe to verify that all wood products bearing an FSC label are harvested from forests and woodlands that are managed in an environmentally sound way. The certification process also ensures that the forests provide benefits to their local communities. The process offers a way for local communities to have a say in how their resources are managed. Environmentally friendly products are not only beneficial for the planet, they’re often beneficial for humans as well. For example, we use water-based finishes, not just because they’re more environmentally friendly than oil-based finishes from a disposal standpoint but, because water-based finishes also have lower volatile organic compounds (VOCs) than oil-based finishes. Have you ever realized that you just walked into a freshly painted room based solely on the fact that you can still smell the paint fumes in the air? Part of what you’re smelling are the VOCs. They act as irritants to sensitive organs such as eyes and noses. Long-term exposure in confined spaces (e.g., indoors) can result in adverse health consequences. Low VOC content means that the product off-gasses (i.e., completes the process of releasing VOCs into the air) within a matter of days vs. months. This is why we used water-based finishes on our furniture and cabinets. Do water-based finishes cost more? Yes, they do. Do environmentally sustainable wood products cost more? Often, they do. But, we believe the investment is worthwhile for the long-term health of our clients and our earthly home. To learn more about the importance of forest sustainability, visit the FSC’s page on Why Forests Matter.